The objective of this Lab activity is to verify the voltage division properties of resistor networks. In this tutorials we use the terminology taken from the user manual when referring to the connections to the Red Pitaya STEMlab board hardware. Extension connector pins used as 5V voltage source are show in the documentation here. Fig. 3.1 Figure 1: Voltage division. 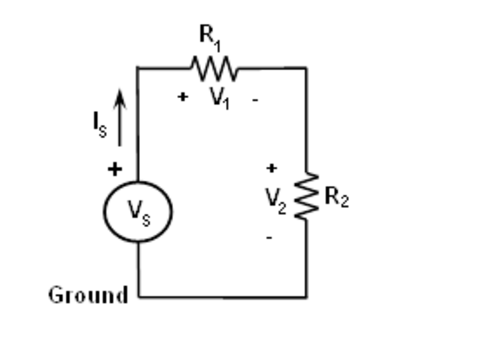 Construct the circuit as shown in Fig. 1. Set \(R_1 = 4.7 k\Omega\), \(R_2 = 1.5 k\Omega\) and use the fixed power supply 5 V pin from extension connector as voltage source Vs. Use the Oscilloscope application to measure the voltages V1and V2Repeat this step for R1= R2= \(4.7 k\Omega\) and write down the measurements. Calculate the voltages V1and V2by using Eqs. (1) and (2) in each case. Compare the results from steps a and 1.